The midday game on Western Oval pitted IC14 old rivals Great Britain Bulldogs and Fiji Tribe against each other for the second time. These sides fought a tough encounter on Community Cup Saturday at Bulleen and the enjoyed a social evening at the Manningham Cobras rooms. 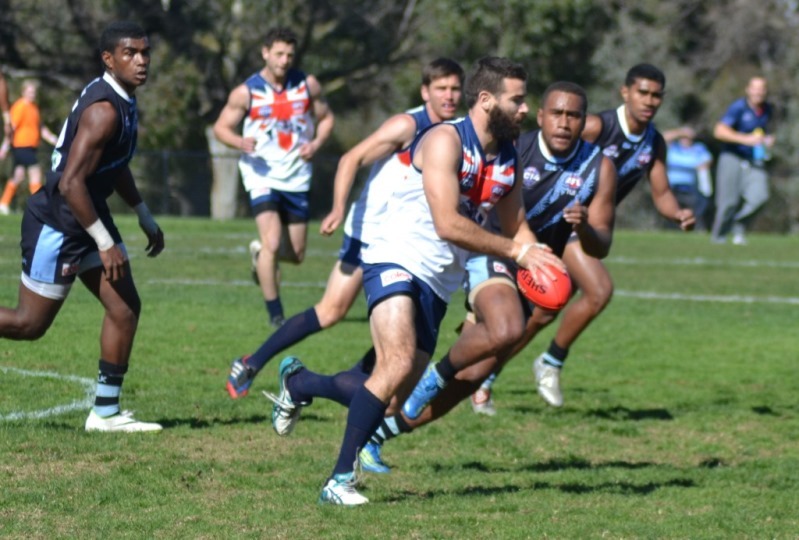 Friends were made, respect established – but today all that matters is finishing off with a win and for the Bulldogs having lost successive matches to Nauru, Fiji and Nauru again – there was a sense of having underperformed. With the sun beating down with perhaps surprising intensity, Sean Walton (#21) the Bulldogs skipper won the toss and elected to kick to the golf course or western-tram track end. Without a significant breeze and with the morning dew dried up the conditions were perfect for footy. On the sidelines the Fiji Tribe enjoyed the extra support of the earlier successful Fiji Vonu ladies team; And with national pride on the line the scene was set. Fiji had the better of proceedings early and were putting the Bulldogs defence under pressure. The first score being a rushed behind, follow by a snapped behind. Ironically it was forward line pressure that got the job done first – at the other end – when key forward Sam Willat (#2) laid a tackle and drew the free – and lining up for the long shot at goal instead caught the defence napping chipping over to (#13) Scott Rymer who kicked truly. Wiilat was in the action again shortly after but his left foot snap went behind the post. The Bulldogs though had gained some momentum but Fiji were defending capably and (#23) Dylan Wolfgramm was playing an important sweeping role across half back – generally making his possessions count with his precise left boot. End to end play saw both sides seeking a gap through the defences and the best chances were generated by the Bulldogs but a snap by #25 went left and Willat after receiving from (#24) Saunders looked off the boot to be home but just missed. By quarter time the Brits had gained some ascendancy but with 1.3.9 to 2 points they hadn’t hurt their opponent nearly enough on the scoreboard. With the sun beating down the Brits headed to their huddle and then headed the huddle towards the shade near the boundary. The first quarter had featured high pressure with contested accountable footy. Matias (#1) had been a key all tournament for the Brits and again looked important when he got his hands on the ball but was rarely afforded anytime to cause damage. 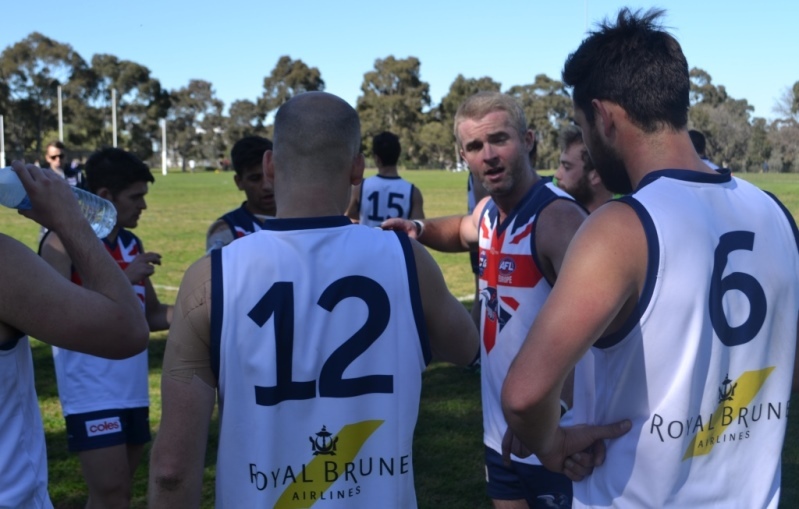 (#14) Irish Brendan McGeever had a fine first term controlling the back line for the Bulldogs and his leadership on the field was echoed off it in the huddle as he rallied his comrades. For the Tribe – the key role so far of the composed Wolfgramm of interest given his heavy workload combining Tribe duties with Manningham Cobras matches. The 2nd quarter began similar to the first – Fiji going forward and pressure on the Bulldogs backs. A rushed behind started scoring. For the Tribe Wolfgramm had been switched forward. The Brits though pressed again but just missing a little polish. Willat in particular was struggling to clunk the marks but was as always dangerous at ground level but his snap on goal was partially smothered and bounced through for a behind. 1.5 to 0.3 and suddenly the Tribe’s energy levels increased. Key players began to get their hands on the ball especially #2 Vatutei and #11 Valesu. Vatutei loves a run and given the chance will run and carry and has drilled many a goal on his trusty left foot. Creating opportunities it was an opportunist goal Solomoni Cati with a fine quick snap from the pack and Fiji just 2 points down. Vatutei again featured to drive the ball forward with penetration. Ending up with Dylan Wolfgramm who never looked like missing and the Tribe headed into the long break 4 points clear. Bulldogs coach Mark Pitura was clearly frustrated – and from the shade he urged his charges to show greater team play, greater mateship and less individual play. Clearly frustrated with a below expectation tournament he put it on his players to show what they were capable of. The third quarter – so often the ‘premiership’ quarter went very much that way today. The Brits looked refreshed for the 2nd half and after the early goal to the busy Saunders and the Brits were back in front. Matias read the ruck and squeezed out a kick towards Maguire (#18) who drew the free for in the back. Fiji’s defence were caught napping – not filling the ‘hole’ and Willat was able to lead up and receive a textbook pass. 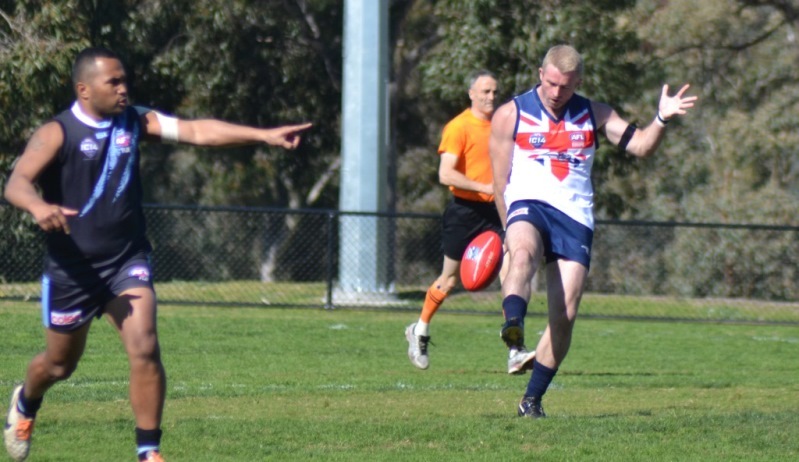 The kick from 35 out directly in front converted; shortly after again Willat taking the ball in general play and dishing off a handball for (#8) Harmeston to run into an open goal and the Bulldogs had slammed on 3 goals to lead by 14. Fiji only managed one partially effective forward foray for the term – with a mark and behind to #14 who was looking lively up forward but lacking support. Up back #25 was providing rebound but for all their work a solitary behind was the result. The Brits however hadn’t finished for the term and narrowly missed a 4th for the quarter when (#3) Worthington’s shot from the boundary drew an early celebration from the kicker only to fade into the ‘woodwork’. The wait for the 4th didn’t last too much longer – on the cusp of three quarter time Matias ran onto the ball and kicked truly and the Brits took a 20 point lead to the last break in the shade. The final term held few real highlights – the Tribe lifted their workrate but with only 3 behinds to show for their effort were not making sufficient inroads on the scoreboard. Perhaps the highlight was a lunging tackle by Willat that drew a free – however the last shot of the game went just right but made it an even 3 goal margin. At the end the Brits were jubilant and had gained revenge for their loss the previous Saturday at Bulleen. The Tribe were vanquished on the day but had lost no fans and shown tremendous improvement from 2011 and are clearly a top 10 nation with valid aspirations to go higher.